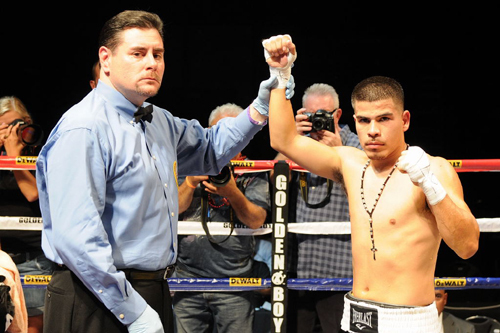 It was Juan Garcia and Hector Serrano’s opportunity to shine in the latest installment of “ Fight Night Club.” The budding prospects fought in front of recently crowned IBF Bantamweight Champion Abner Mares who sat ringside with several other boxing luminaries. The grand stature of the newly crowned champ did not take the spotlight away from the fighting inside the ring. The latter was due to the valor of the young pugilist who entertained the massive crowd. 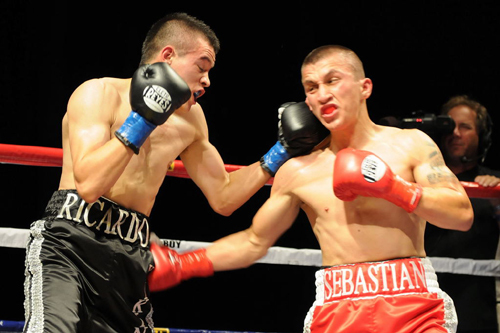 The main event saw Juan Garcia 15-3, 5KOs earn a unanimous decision against Hector Serrano 13-3, 5KOs in an instant classic. Garcia’s win headlined “Fight Night Club,” at L.A. Live’s Club Nokia presented by Golden Boy Promotions and AEG and sponsored by De Walt Tools, Budweiser, Super A Foods and Metro PCS. The card will be aired on Fox Sports Net. 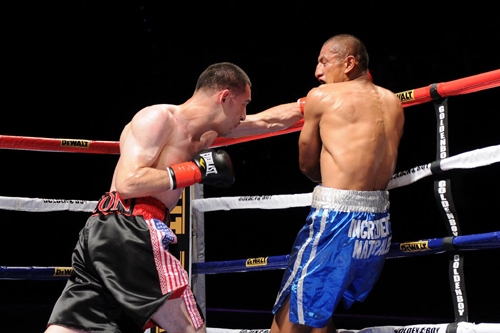 The featured bout began slowly before Juan Garcia’s lounging left hook landed. The hook instantly opened up the scrap for the Angelino. The remainder of the bout was an instant classic. 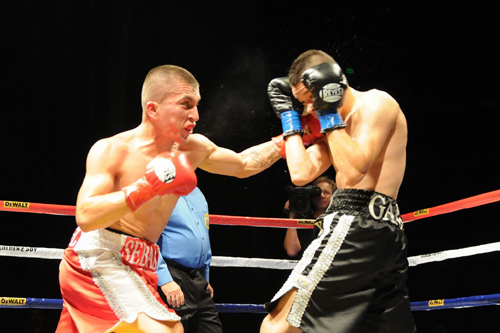 Garcia dominated in the midst of Serrano’s fearless effort. Juan Garcia’s bull like aggression forced Serrano to fight with his back against the ropes, giving Garcia an opportunity to sit on his punches. Consequently, Garcia buckled Serrano in the second with a flurry of hooks and seemed to fracture his nose in the third. Just judging by the continuous down pour of blood from Serrano’s nose. The bloody affair continued into the fourth and fifth round where Juan Garcia landed some amazing right hooks that sent blood spiraling into the air while Serrano counter punched, often landing some serious heat. Juanito remained undeterred, pressing the action and eventually landing a pinpoint right hook to the body. The body blow ensured Garcia’s victory as he just walk through the valiant and weary Serrano for the remainder of the final round. When it was all said and done, one judge scored the fight a draw57-57, while the remaining two scored the bout, 58-56 Respectively. 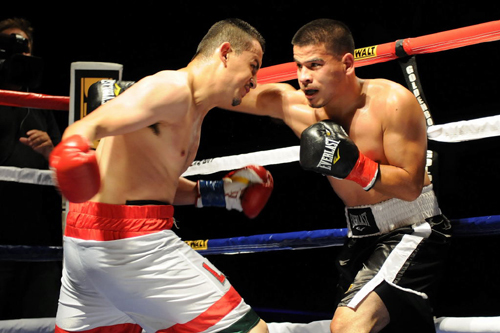 East Los Angeles’ Ramon Valadez 10-1 5 KOs earned a unanimous decision victory against Noe Lopez Jr. 8-10 5 KOs of Nogales, Mexico in front of a dormant partisan crowd. The six round Lightweight duel was the co-main event of the night. A straight right was the only highlight of round number one. 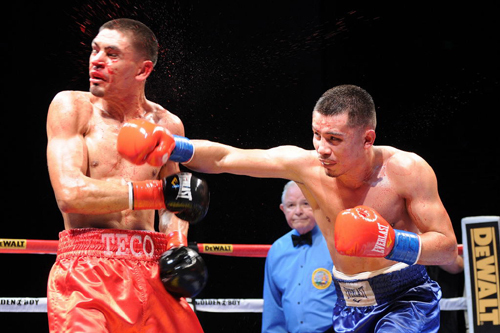 It was Valadez who unleashed the laser like straight to score his first knockdown in an otherwise lackluster round. 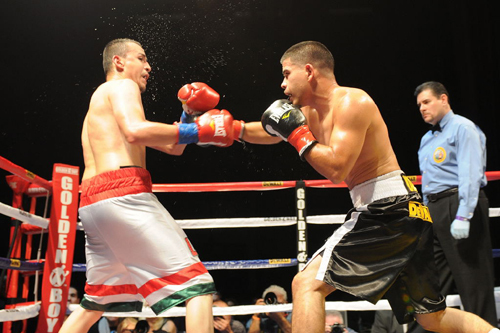 The action quickly picked up the following round as Lopez found himself pitted against the corner, forcing some exciting exchanges on a multitude occasions. The following rounds saw little action as the fight morphed into a tactical scrap with Valadez taking a slight edge on the cards in each subsequent round. 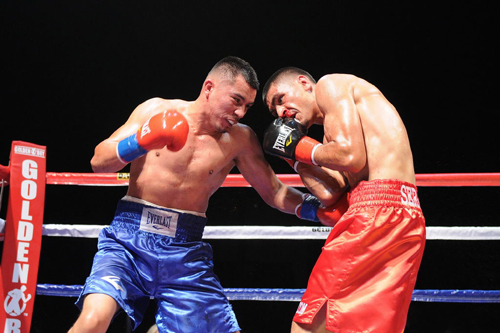 Valadez straight right remained a constant in the fight. His straight was almost unimpeded in round number five. Surprisingly enough, the fight ended with boos from the crowd. The Partisan Valadez was not able to close the show in style but still earned a quality victory against a valiant opponent. 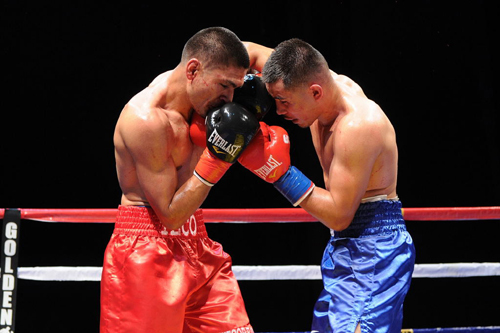 All three judges scored the bout 59-54, handing East Los’ own an unanimous decision victory. Santa Ana, California’s Jose Sanchez 5-2 2KOs stops La Habra’s Ricardo Garcia 2-2, at the 1:11 mark of round number two. The Junior Lightweight bout was originally scheduled for four rounds. The fighters kicked off the televised portion of the card immediately igniting fireworks. 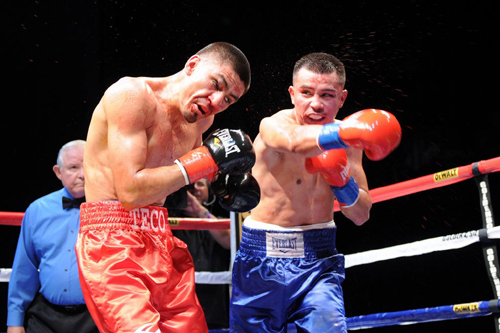 Sanchez initiated the action with his thunders’ left hook, which landed at will. It did not take long to breakdown the courageous Garcia. The La Habra’s native willingness to take a few to land his own allowed Sanchez to continue to walk him down. Sanchez proceeded to connect with some crisp shots into round number two. He went on to land a picturesque left hook in the same round that floored Garcia for the first time. Sanchez then followed through and ended the bout with a brutal combo. Flint, Michigan’s Dion Savage 11-1 6 KO’s made his return to the ring six months after being brutally KO’d my promising Mexican prospect Marco Antonio Periban. The skilled super middleweight seemed to be still feeling the affects of his only defeat. 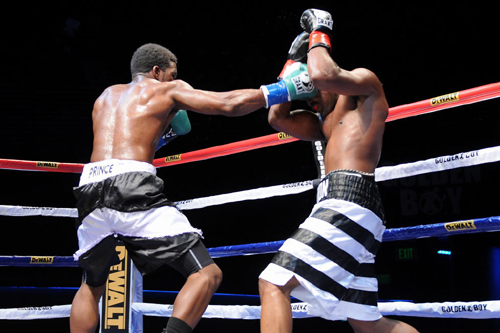 The Flint native came out cautious from the outset of the bout against a soft Edward Tigs 1-2-1 from Fitchburg, MA. The entire fight was a snooze. Savage won just off of mere activity. 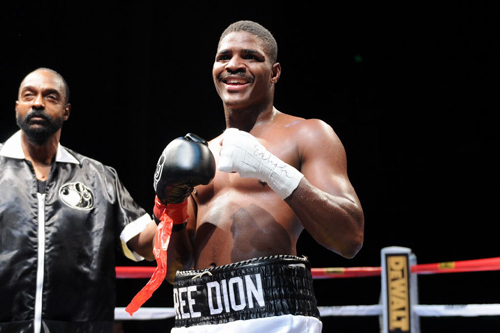 Two judges ringside score the bout 60-54, while the remaining judge scored the bout 59-55 in favor of Dion Savage. Oxnard’s Ernesto Ocon 4-0, 2 KO’s earns a hard fought unanimous decision against Juan Carlos Diaz in a four round welterweight bout. Two judges scored the bout 40-35, while the remaining judge tallied the bout 39-36 all in favor of Ocon.